This is a really cool project. One question I have about several weather stations projects I’ve seen is in regard to battery chemistry. Most of them use some form of lipo, but how do these perform in subzero weather? My understanding is that charging lipo is a problem below freezing, but maybe there is a solution to this I’m unaware of? I have not seen commercial stations that uses LiPo. Most use NiCd or NiMh for solar rechargeable sensors. On my station sensors that are battery powered I use lithium primary cells. They last for a very long time and don’t drop out like alkaline cells in low temps. If it is a homemade one then unless they are in a warm climate they are going to have problems. I started a solar-powered WiFi AP project and settled on NiMh because it needs to work in the winter, but I thought maybe someone figured out how to reasonably use lipo’s in the cold (which would be nice for a number of reason). Looks like I’ll stick with NiMh for now. Davis weather stations (at least VantageVue and VantagePro) use supercapacitor charged from small solar panel and primary (non-rechargable) lithium 3V battery as backup, that is for outdoor wireless unit. It works at -20°C without problems. Indoor unit uses AC adapter and C-cells as backup. Oregon Scientific stations use AA cells for outdoor unit, and cells have to be replaced like once a year. So if design of outdoor station needs LiPo or similar batteries it’s probably a bad design that uses too much power. A peizo disc will sense a raindrop and give you a sense of the drop’s size too. If there is no cloud cover at night, a upward pointing IR thermometer will read a temperature colder than the air temperature. Yes I have consider this in the past but rulled it out. The capasitive sense seems easier to me. Power consumption wise is a constantly on amplifier circuit a good idea? I live in a warm climate, so I have been using LiPos without issues, but I agree with the concerns for sub zero temps. An interesting chemistry not so popular is rechargable alkaline. I believe this is ideal for many reasons. Its enviromental friently, its low cost, it’s easier to ship abroad than lithium (if this would end up in a real product), it works below zero (I have been using them on profetional weather stations on Greek mountains a few years now) and most interesting it is … 1.5 volt which potentialy simplifies the power circuit enabling one to power the MCU directly at 3V, to minimize loss. ESP8266 runs fine with 2 of them. The only dissadvantage I see, is that low cost solar battery charger modules are tunned for LiPos. NiMh is not that popular any more, so I can’t find some of-the-shelf module to charge the alkaline batteries (same concept with NiMh). Hmm. Mostly seems like a solution looking for a problem. I have an Oregon scientific weather station and the direction and anemometer are on my roof and have not had to touch it in nearly 10 years and it works perfectly. The rain gauge just needs batteries changed maybe yearly. I think a standard anemometer will be more sensitive that the setup he is trying to put together. Mine will be rotating when I can barely feel any wind. Cockatoos destroyed our anemometer by sitting/chewing on it. It sounds bad, but hey! You have cockatoos! In some situations though, a few leaves or birds can create a problems on the rain gauge, and high wind, or low-quality bearings can cause problems on wind sensors. Also, this direction I am suggesting opens up a really low cost end result / product. Consider inertial sensors for pedometers… if you described this to me a few years ago I would tell you it will never work and if it does one day, it will be way expensive/complex. Now you have 10€ smart Wristbands that measure your steps acurately enough to provide some usefull info. Similary, one day we could have IMU integrated libraries for pendulum wind sensing enabling 10€ wind meters! Live in the north and using more heavy duty davis anemometers. They consistently failes after 8-8 months. Usually just the impeller breaks, but sometimes the vane breaks as well, and have had the entire aluminium shaft and sensor break of. And during winters it only works about hjalf the time because of icing. for the wind direction, using a magnetometer (usually associated with imus) and attaching magnets to a wind vane works surprisingly well, this is what we do for our sailing robot (here: https://hackaday.io/project/13096-southampton-sailing-robot/log/43649-a-cheap-and-simple-wind-direction-sensor ). However I’m trying to avoid moving parts all together. Jokes aside, I can see a carefully weighted and sized pendulum using a accelerometer/IMU to measure wind direction and speed – it’ll be a non-trivial math problem, but I think solvable. But now you have wires running down the pendulum and flexing at the pivot point. I’m not sure that’s less maintenance than current solutions. I also have some doubts about accurately measuring rainfall with a capacitive sensor, but I’d love to be proven wrong. I wonder if he considered an ultrasonic anemometer? I don’t think the wires are a problem, everything lives in the “weight” of the pendulum, so the pivot is just a mechanical joint. I’m not sure how the cap sensor would work though. You can certainly tell that is /is/ raining, but not how much. End of the fourth paragraph suggests he’s not sure if the entire unit is in the pendulum or just the sensors. The enclosure is (will be) 3d printed, so a ring at the top of the pyramid is enough for attaching a tether. No need for a mechanical moving joint if that’s what you mean. 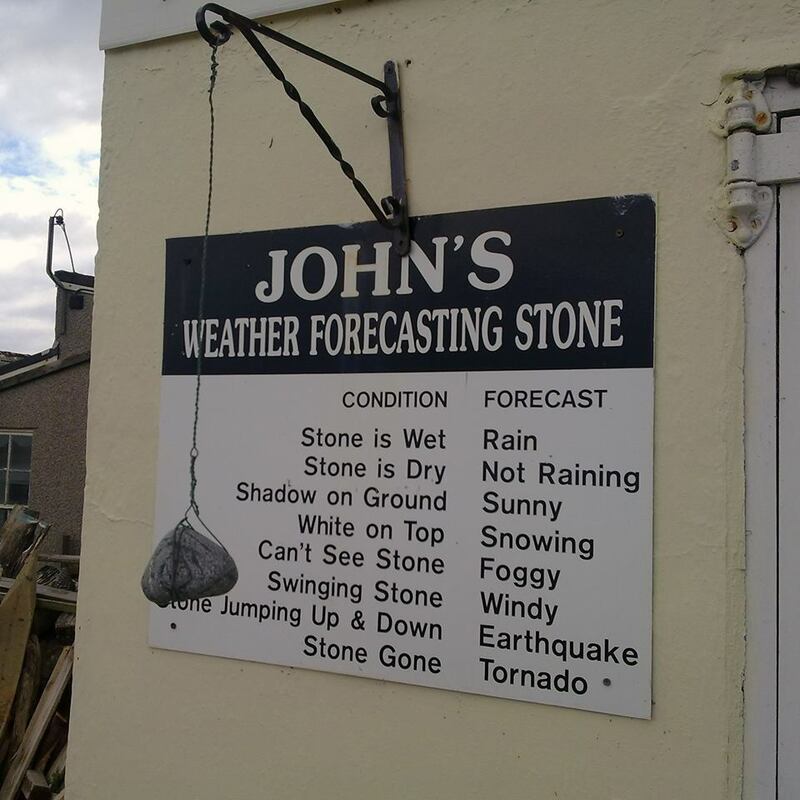 Actually, the weather forecasting stone was the source of inpiration for this. Regarding the maths, yes I guess it will be hard, but I’m trying to find sortcuts, i.e. reverse engineer the model without really understanding the maths, instead of doing forward modeling. E.g. have the pendulum next to a traditional weather station, both sending data non-stop for a few days and then try to relate the two. Some fancy weather stations use 3 or 4 ultrasonic trandusers to measure wind spped and direction. I don’t know if this can be done cheaply or easiliy or if its practical for battery operation. Measuring drifting charge might be too sensitive. If memory serves the cooling effect on a hot wire can be used. hot wire approach will definatly consume more power, thus I rulled it out. yes, professional wind sensors are ultrasonic and are quite expensive and robust. Yeah, that’s what came to mind when I read “Solid State” in the title. well.. yes, good idea, I have considered this. In fact I was thinking to use more than a few mics, and solve the direction problem. How can one measure wind in urban noisy enviroments though? filter out non-wind-matching signals ? Also not sure what will happen to the mics after some time, or when its raining, etc. The 3D-PAWS project has a few issues that I’ve been looking at and trying to improve upon before I reach out to that team. As mentioned above the sonic anemometer is a good choice if you don’t want any moving parts. You can also put a vain on a pitot tube and measure the wind speed that way while getting the wind direction from an absolute position sensor connected to the shaft of the vain. Solar irradiance is another parameter that is very desirable to collect. 3dpaws is a cool project. However if we are going to 3d print it, we might aswell think out side of the box and create something new, instead of trying to reproduce the traditional design, and “waste” the advantages of the 3d printing industry by producing injection molded like shape parts. It will be imposible to compete with mass manufactured ones that way. One major dissadvantage of traditional weather stations (and 3dpaws) is the the installation requirements due to all the tubes and equipement extruding from here and there.. Imagine the beaty and simplicity of a “pyramid” that you just hang outside anywhere, and installation is finished. What you’re describing already exists in the commercial weather market. You can go with Lufft: https://www.lufft.com/products/compact-weather-sensors-293/ws800-umb-smart-weather-sensor-1790/ or Viasala: https://www.vaisala.com/en/products/instruments-sensors-and-other-measurement-devices/weather-stations-and-sensors/wxt530 or Climatronics: http://www.climatronics.com/Products/Weather-Station-Systems/AIO_compact_weather_station.php. I personally have the Climatronics one. Airmar has a number of options: http://www.airmar.com/weatherstation-info.html?category=WX and some of them can be had for less than a high end Davis unit. Put one of these up on a mast, run some cabling and you’re done. While these are very expensive units they do offer some great ideas how to make a compact unit. I’ve worked with a number of ultrasonic anemometers and I don’t really think one would be all that hard to design and built. There’d be a bit of math involved however it’s all well known principles you’d be working with. There is already an ultrasonic wind sensor for DAVIS meteorological stations! If you open up one of this there is so much complexity, massive BoM, so its hard to go bellow this price point without doing a fresh start. Thats what I am trying to do. Move all the complexity in software/firmware. Also.. installing these all-in-one units, still requires some effort. It has to be mounted perpendicular thats why they usually have the small bubble thingie and most of the times you need to find true north, and point it towards there. I assume ultrasonic ones might use a digital compass, so they can find the direction on their own, but then we are again talking about quite more expensive equipment. You are correct that some of the ultrasonic and All-in-One weather stations have the ability to sense magnetic north and then work from there. Since wind direction is generally referenced to true north you still have to provide them with the magnetic deviation for your current location. Along with your rain gauge, you could double check it by usualy some variation on the “collect and auto-tip/dump” which many use, with this variation… add a load sensor to measure weight. Calc the ramp up of weight for rate of rainfall, plus, calc the totals. Rate is one more item and a double check of the other sensor. And while I like to see wind-speed as a digital number, I also WANT to see an analog representaion of the wind direction that shows the sensor swinging slowly of rapidly. This visual feedback says much about the character of the wind/weather that no digital number can show, no matter if updated each 1/4 second to the nearest compass degree…!!! Sometimes, analog rules. In fact, if the shape of the enclosure was more aerodynamic, we could achieve both a better analogue representation and an smother motion for the inertial sensors to follow. (e.g. a hang glider kind of thing). However I decided to work on that after I get most of electronics working. For the time being, I kept the pyramid shape mainly for the looks, and to create enough shadow for the temp sensors at the bottom, and also usefull angle for the solar panels. Strain / load sensor for a scale. ok, interesting idea but what about wind direction? you will need somekind of x-y strain gauge(s) ? and what about high winds? how robust will this be? I guess could concept would work better if you add some mechanical stuff to it, but then again, we want it solid state. Wind direction. Could be calced from sensors on 4 sides. But it couldn’t have a pyramid on top? Ok. The pyramid is hanging in space. Up is down and the bottom is the top. The botom has whatever passive probe and strain guages for wind direction and amount…? I read description on author’s page and it looks like a weather alarm project, not weather station. Numbers (rain and wind) are roughly aproximated, so they will probably tell you if rain is falling and wind is blowing, but not much more. And measuring temperature inside black case, not a good idea. Davis, Oregon and similar low-cost weather stations last for at least 5+ years without maintenance on (precise) wind and rain measuring assemblies, I doubt that pyramid hanging form a rope and flapping in the wind and rain will achieve that service life. However, I don’t want to be negative and hope that project will render some useful hardware and knowledge about measuring enviroment in low-cost and still usable ways. However, the beauty is that it can (hopefully) improve its accuracy with firmware upgrades and not hardware modifications. A “proper connected” device should be happy to receive as many as required OTA (over the air) firmware upgrades. In that sense, even mistakes in enclosure leading to BIAS can be corrected once they are measured/observed. In general, precision is a big discussion. If we create a “precision/cost” index, I have a feeling that low cost stations (sub 100$) will score very high. I mean you can get very good accuracy for very little cost. Eg a bosch BME280 temp/hum/pressure sensor that costs a few dollars combined with a decent stevenson box (solar shield) seems more than enough to me for the average weather enthousiast. Wind/Rain the pyramid way, are a different story ofcource but then again, we are not talking about scientific equipment here. Also, consider that this “product” does not aim to replace a more expensive one. It aims to replace the lack of one. Most people who are interested in weather conditions do not bother to deploy their own weather station. If it was dead simple and cheap, some of them might reconsider. If we can create weather data where no data are available, thats a big win – even if their accuracy is not that good. Davis has improved the traditional approach to a point that it is quite reliable and low maintenance (depending on the conditions it might require some), however we are talking a diffirent kind of low cost here. Weather pyramid BoM is at ~20$ !! Also, Devis like most weather stations requires quite some effort to be deployed/installed. I was recently reading about ADC, Analog to Digital convertors, reguarding load cells. A scale may seem to need 10 or 14 bits, but after noise etc energy, 18-24 bits are required for high accurracy. If you want to make an inexoensive/exoensice verion, have oads on your board for the 24 bit (or whatever) and use fewer for the cheapy/prototype. Also, where grounnd planes are on the analog and digital sections matters to isolate them from each other, yet if course, the less distance analog uses to get to digital helps too. A team working on this is an idea. I wonder if you could use a Venturi and measure wind speed by the amount of vacuum it draws? There would be the problem of pointing it into the wind, of course. Not if you have use multiple units on different directions, then you can calculate direction too. Integrate a pitot tube into a wind vane? Actually a very good idea when you regularly have winds in excess of 100 MPH and ice accretion rates that can exceed three inches per hour. I spent a couple of years working on top of the “rock pile” working with the instrument described in this block post: https://www.accuweather.com/en/weather-blogs/clarkb/instrumentation/14828. yep.. this is something I have consider, and it is a good fit for 3d printing. But then again, what happens when insects use the tubes as their home? Yes, you would need tubes. However, you can always shield them with some mesh, right? Paper clip + chewing gum + Machine Learning for the win! absolutely… however today’s paper clip is 3d printed, chewing gum is arduino, and machine learning can be applied from cloud to edge embedded systems with drag and drop tools, by fools like me, with out understanding the maths. Seems to me that you could place the IMU at the top of the pyramid (no pendulum) and measure the deflection of the pyramid caused by the wind hitting it. Actually you’d be more measuring the vibration in the x & y directions to give you direction and the total amplitude to measure windspeed. Or would gusty winds confuse the matter? I’m guessing gusts would be far lower frequency than the vibration modes of the pyramid. The pyramid shape is probably not ideal. Maybe a sphere on top, with an internal cross that keeps the IMU in the center so it can receive vibrations from multiple sides (kind of) equaly. Another crazy idea! :-) I like it, I will look in to it. Thanks! New request. While I can aduously look up Sunrise and Sunset or Solar Tables, I really want a light intensity. Instant, Average up to that point in the day, and weekly, monthly and annual totals. Some may want UV also or IR. Bonus, Chill Hours and Heat Days. Weather differences are messing with what fruits a person can manage to grow. Old tables are becoming unreliable. Perhaps having it dumpable into Excel would help. That’s really cool. All the best for your Weather Pyramid project. How difficult is it to implement AI in a weather station to answer frequent questions like the ones implemented in Ambient models? I read it can provide all-sort of answers regarding weather on this site https://www.weatherstationlab.com/.